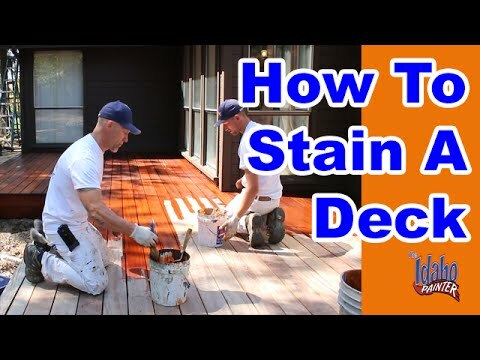 Find out how to stain a deck by reading our step by step tutorial which includes video resources and a cost guide for all the needed material. Why should we stain a deck? All timber decking areas need protection from the weather and from wear especially in the areas that suffer lots of foot traffic. Giving your deck a new coat of stain is the best way to keep it looking good and protected from all kinds of wear and erosion. With what do we stain a deck? Transparent stains will completely soak into the decking boards while a solid stain will stay more on the surface like paint. The other types fall between these two extremes. The type of stain that you choose to create the desired effect will determine how regularly you need to stain the deck. Generally, newer decks require more transparent stain and less of the heavily pigmented stain. This is because new wood will often have a very beautiful natural grain and people prefer to see the enhanced grain rather than hidden behind a screen of colour. The disadvantage of using clear stains is that the deck wears faster and will need to be re-stained more often. You can use heavily pigmented stain on new deck but you will hide the beautiful grain and cover up its natural beauty. Usually a transparent stained deck will need a new application every year whereas a solid stain will need a new application about every five years. Waterproofing and sealing. Sealing the deck with UV (ultraviolet) rated waterproofing sealers will almost double the time needed between stain applications. The sealers will give the deck and the applied stain, protection from the weather (especially rain) and the bleaching effect of the sun’s ultraviolet rays. Sealer is easily applied with a paint roller but it takes a few days to apply and dry so you will have to choose the correct day for doing the job before anyone can walk on the sealed surface. For best effects the sealer should be applied twice a year. Effects of weather. Surprisingly decking that is situated in shady areas with humid and wet atmospheric conditions will wear as quickly as deck situated in hot and dry conditions. Whereas sunny and dry conditions will tend to bleach the stain and wood, shade and wet conditions will start to wash away the stain and encourage the growth of moulds and fungi. Patches of the deck will become blackened and will need to be sanded, bleached and cleaned to remove the marks. Those decks that are exposed to long stretches of sun or humidity will require staining and sealing more often than normal to counteract the weathering processes. Effects of use. The more that you use a deck, the quicker it will lose its colour and need re-staining. Under really extreme conditions such as next to a beach, the deck will require re-staining much more often than normal. Sand dragged onto the deck from shoes, feet and even sea breezes will act like sandpaper and will help to sand away the stain and sealer from the surface of the wood. Keep an eye on the condition of the wood and stain especially if you regularly have big parties. The deck will probably require staining and sealing much more often and especially before the next social event. Should we choose clear or opaque stains and sealers? As we said previously stain comes as transparent or opaque and all the varying combinations in between. The question is that regardless of the colour preference which one should you choose and which one is best for the wood. In general the more opaque the stains, the better it can withstand wear and weather. Having said that, more transparent finishes allow more of the natural wood colour and grain patterning to show through. Transparent and wood toned stains will enhance the wood’s natural colours. Semi-solid and solid stains almost obscure the natural colour and grain pattern but will allow deep and vibrant colours to predominate. These finishes last the longest against the weather. If you want the stain to really well cover and adhere to the surface properly you must make sure the surface is sanded to remove all traces of the old stain and all dirt and dust removed. Prepare the surface. First thing to do is to check that every nail and screw is countersunk at least two millimetres below the surface, This is so the metal heads do not rip the sandpaper when you come to sand the surface. Punch in the nails using a nail punch and drive in the screws using a screwdriver with the appropriate head. Belt sand the surfaces. The most efficient tool to sand large flat areas is the belt sander. Always sand backwards and forwards in the same direction as the grain. If you sand across the grain you will find that the wood will scratch and the damage will be visible when you come to stain. If you are removing stain or paint already on the wood you must start with a coarse grade sandpaper (such as 40 grit) to remove as much of the old finish as possible followed by sanding again using a finer paper (such as 120 grit) to make sure you have a smooth surface. Finishing sand the surfaces. The belt sander is great for making quick work of sanding large expanses but it is useless for doing detailed work. For that you need a finishing sander (sometimes known as an orbital sander). Push the finishing sander into corners, along edges and into other areas that the belt sander won’t reach. Don’t push down on the sander too hard or else you will gouge out hollows in the wood. Just let the weight of the sander do the work for you. Don’t forget if you are removing paint or stain then start with a coarse grade paper followed by a finer one to smooth the surface. Clean the surfaces. Now that we have finished the sanding of all the deck we will have a lot of dust sitting on the boards. The sand needs to be removed otherwise the stain will make it stick to the boards. For this you will need a broom to sweep everything into a pile followed by a dustpan and brush to pick up all the debris. The type of broom you use will depend on the depth of the grooves on the decking wood. If you have deep grooves then you will need a stiff bristled broom to get right down into the hollows and remove the debris. Cleaning new surfaces. If you want to give new timber its first coat of stain, you will have a problem. New wood often contains many tannins and oils that prevent the stain from soaking into the structure of the wood. Normally you will have to leave the wood exposed for four to six weeks to allow the surface to weather before giving the wood its first coat. If you haven’t got the patience to wait that long and you want to get the deck ready for the big barbeque you are planning then there is available on the market a liquid designed for new timber preparation. When applied to new wood it will remove all the oils and other substances preventing the stain from soaking in properly. Don’t forget to thoroughly clean the surface using a deck cleaning solution mixed with water. If your deck needs no sanding, but just a good clean before staining, you need to follow the suggested steps. Sweep up the dirt. Use a soft bristled broom sweep up any leaves or dirt that has got lodged in the timber grooves. If you think the deck needs a more thorough clean, use a hard bristled broom and some clean water to dislodge the grime packed in the grooves. Don’t worry if you don’t own a high pressure hose, you can use an ordinary garden hose. Although the jet is not as strong, if combined with a stiff broom it will do the same job almost as well. Mix deck cleaning solution. Mix a deck cleaning liquid (there are many brands available) with water as per the manufacturer’s instructions. It is very important to measure the volumes exactly and to prepare the mixture in a separate container such as a deck hand bucket. When using deck cleaning liquid always wear protective gloves, safety glasses or goggles and a dust mask to protect your skin, eyes and mouth from splashes. Scrubbing the deck. Use a long handled deck scrub brush and the previously mixed deck cleaning solution to really scrub the deck. Make sure you scrub every inch of the deck so you don’t cause any spotting. Leave the deck cleaning solution to stand for between ten and twenty minutes (no more than twenty). Beware, the liquid is toxic and will kill your plants if splashed on them. Rinse the deck. After the twenty minutes has passed, use your high pressure hose (if you haven’t got a high pressure hose then an ordinary garden hose will do) to dilute and remove the solution together with all the dirt and grime dislodged by the cleaning solution. Allow the deck to dry thoroughly. Now that the deck is fully prepared we can start to consider the staining sequences. Mask the surfaces. There will always be an area that you don’t want to be stained. Perhaps you are staining certain parts of the decking a different colour or maybe the walls of the house are brick or stone and must not the coloured. It doesn’t matter what the reason is, you will have to mask the areas you don’t want coloured. Do this with masking tape for small areas and plastic sheet for large areas. Stir the stain. The stain is made from fine solids suspended in a liquid. You must always stir the mixture well before using it for the first time and stir the liquid at regular intervals throughout the duration of the work. This ensures the pigment solids are distributed evenly throughout the liquid and gives you a consistent finish when it is applied. Cutting in. The sequence of painting is the same as painting a wall or ceiling indoors. You must first use the paint brush to ‘cut in’ the stain at the edges and corners of the deck. Use the brush to apply the stain to the full width of a decking board. This will give less chance of any variation of stain colouration between boards. Use long brush strokes and blend in the edges as you go. Any variations in colour along the board won’t matter as long as the edges are blended. Once you have completed ‘cutting in’ you can remove the masking tape before the stain has finished drying. Staining large areas. Using the decking stain applicator, apply the stain in long even strokes, blending in the edges as you go along the boards. If you prefer, use a soft broom to apply the stain. Remember to start application at a closed corner and finish at an open edge so you don’t trap yourself by painting into a corner. The equipment and tools needed to complete the full job are listed below. Remember that the prices for each item are approximate and may vary depending on where you buy them and what level of quality you choose. You can buy these items from various online stores as well as home improvement warehouses and hardware stores. You may even find items of reasonable quality at discount warehouses. Keep your eyes open for discounted prices. There are a few different tips that various people have found out over the years. A lot of them have been discovered by professionals and others are extracted from the manufacturers’ instructions. Here is a list of these. I hope you find them useful. ✓ Make sure the decking boards are clean and dry before applying the stain. ✓ Apply stain in temperatures between 50°F to 90°F (10°C to 32°C) to preserve the optimum viscosity and drying time of the liquid. ✓ Avoid applying the stain in direct sunlight as it can dry the stain too quickly and create patchy brushstrokes. ✓ Choose the correct application tool. A roller finishes the job quickly whereas a brush forces the stain into the fibres and pores. ✓ Sweep out the boards thoroughly and use a blade to dig out dirt from the grooves. ✓ Always use a good quality deck cleaning liquid on the deck in accordance with the manufacturer’s instructions. ✓ Rinse the deck surface with a garden hose with nozzle attachment. ✓ After washing the boards, allow to dry before sanding down the patches of raised grain and removing the dust. ✓ Check for water damage and splinters before staining. ✓ Check for boards that are rotten and need replacing before you start staining. ✓ Punch any nail heads below the surface before sanding. ✓ Tighten screws that hold the deck to the frame and bolts that hold the frame to the house. ✓ Protect your plants from accidental chemical splashes. One of the commonest problems found by householders who decide to stain their own decking rather than hire a professional is when the stain starts to peel. But what causes this and how can we prevent it from happening in the future? Applying too much stain. This one is easy. It’s caused by too much stain present on the surface. 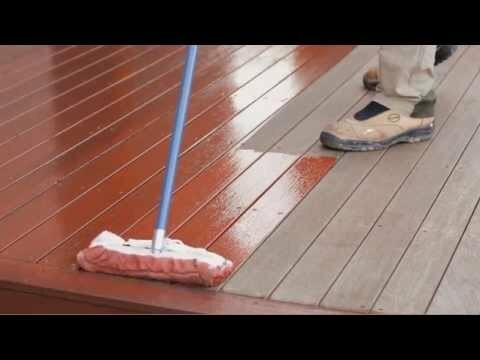 When you apply decking stains you should only apply as much as the deck can absorb. All wood absorbs moisture, usually from rain, and when the rain stops the water needs to dry out, passing through the layer of stain to do so. If there is too much stain then the moisture cannot evaporate and causes the stain to peel off instead. Usually this will happen in the springtime after the rain and snow of winter has soaked into the deck. Lack of adhesion. And this one is even easier! The stain has not properly adhered to the wood surface. If it isn’t stuck then it will peel. These problems can be solved by following just a few basic rules. Allow wood to weather. You should, for best results allow wood to weather before applying stain. Weathering allows the sun and wind to dry out the natural moisture within the wood fibres allowing it to become more absorbent. Weathering also starts the process of decomposition of the fibres, and this allows the surface to become rough and more able to absorb stain. If the wood becomes absorbent then it can hold a lot of stain and holds it deeper within the structure of the wood. The stain will therefor last longer and be less likely to peel. Clean the wood before staining. Cleaning the wood doesn’t only make the wood look good; it also opens up the pores and fibres within the wood, allowing the stain to be absorbed better. Washing the wood with water by means of a power washer is ok but will not clean or brighten the wood on its own. Use the cleaning and brightening liquids specially designed for this job every time you decide to apply stain. Don’t apply more just for the sake of it. Applying more stain than you need to will result in the excess staying on the surface and drying into a film that will stop the wood from breathing. Initially the film will look good but after a while it will darken, hiding the grain and eventually will start to peel. Apply only the amount that the wood can absorb, and no more. Protect from sunlight. Try not to apply stain in direct sunlight or in the full heat of the day. The reason for this is simple. If the surface of the wood is too hot then the stain will dry before it has a chance to fully soak into the wood. It will therefore form a film on the surface leading to eventual peeling. Try to do the job in the shade and if you can’t do that, then only work in the morning and later on in the afternoon. Use a brush, not a roller. When applying stain, any stain, use a brush not a spray or roller. The reason for this is that the bristles on the brush will have the effect of pushing the stain between the wood fibres and helping with the absorption. If you have a large area to stain, you can apply the liquid by spray or roller as long as you work the stain into the wood afterwards using a brush while the stain is still wet. You don’t have to work on your hands and knees with a brush either. You can either buy a purpose made stain application brush with an extended handle or use a soft broom with natural bristles. Buy a good quality stain. Some of the ingredients found in modern wood stains are there to promote UV shielding, adhesion, absorption, fungal resistance and many more benefits. The easiest way for the manufacturer to reduce the cost of a gallon of wood stain is to cut down on the quantity of these important ingredients. Unfortunately this means that the stain is no longer doing its job efficiently. If you want to use a wood stain that will do its job for many years then buy a good quality and more expensive wood stain. Don’t buy a cheap one! Let the deck dry out properly. The secret of making sure the stain on your deck is absorbed and doesn’t peel is to take your time. And that means to take your time at every step. When you have finally finished applying the wood stain, allow it to dry thoroughly preferably for longer than the manufacturer suggests before you start to put deck furniture on it or walk all over it. Twenty four hours at least would be a good length to leave it alone. Proper maintenance. A little bit of regular maintenance can work wonders. Just like you would wash your car regularly to remove corrosive salts and abrasive grit, so should you do the same with your newly stained deck. Occasionally wash the surface with a broom and a hose pipe to remove dirt and leaves and prevent them from damaging the surface. How about composite decking timber? You can stain decking made from synthetic materials but check with the manufacturer of the deck as the different synthetics can react differently to the stains. Not all decking is made from real wood; some decking is made from Composite Timber. Composite timber is made from a combination of plastic and wood fibre or wood flour. Sounds like it has the best of both worlds, doesn’t it? Unfortunately the wood flour within the composite is very tasty for types of fungus and mildew, so we have a case where the decking starts to develop black spots of mildew everywhere especially during times of the year or regions where you have high temperatures and high humidity. Although it is a prevalent problem it is also very easy problem to fix. Cleaning a Composite deck. The first step in getting rid of mildew and its associated staining is to remove all the surface solids that can be removed. This is done by using a power washer. When working with composites a power washer is always better than using a garden hose and hard bristle broom. Everything that can be removed will be removed using a power washer, so take it easy, let the water jet do the work and take your time. Taking your time is probably one of the most important rules to follow when maintaining decking as debris that is not removed before staining will not be removed after the project is completed. Use a ‘safe’ cleaner. The whole cleaning process will work best if you use the appropriate cleaner to start with. Sometimes to save money people use ordinary household bleach as a cleaner. This will definitely kill mildew spores but it won’t remove them from the wood and any splashes will definitely harm your plants and shrubs in the garden. Instead it is better to buy a purpose made ‘Composite Deck Cleaner’. A good brand is DEFY . If you also use their Crystal Clear Composite Deck Waterproofing Sealer everything will be fine. Both these products have been specifically made for cleaning composite decking including TREX. The deck cleaner is environmentally safe and will not harm plants. Once the deck has been cleaned it is better (although not compulsory) to seal the deck and we have mentioned the sealer previously in this section. Properly sealing the deck will ensure you get many years of use out of the composite deck before having to clean it again. If you decide not to seal the deck then you will properly have to clean it every year. Using a sealer. When choosing a sealer you will want to buy the proper one for the job. There are solvent based sealers and water-based sealers, they both have advantages and disadvantages in use but the water-based ones are better for our purposes. Solvent-based sealers will turn the color of the composite into an amber color while most water-based sealers are completely transparent and will not affect the color of the deck at all. Some water-based sealers, but not all, use synthetic resins which have no food value for mildew. Choose a sealer with zinc nano-particles. Zinc naturally stops mold growth and will help prevent the mildew from re-growing. A good sealer to choose has already been mentioned (Defy Composite Deck Sealer) as it ticks all the boxes of the properties we have just mentioned. When you come to use the composite deck sealer, remember to read the instructions. Everything you need to know will be written on the back of the container (or get the MSDS from the manufacturer’s website or the retailer), but take the trouble to read it. It will tell you the drying time, how many coats to apply and how long to leave between coats. When you apply the sealer, use it with the same application method as you did with the natural wood stain, use a brush. The brush will force the sealer into the pores within the composite and allow the sealer to be absorbed. The more sealer you can get inside the composites, the longer the protection will last. Once again I will say that you don’t need to go on your hands and knees with a brush, use a broom with natural bristles and a long handle. Wipe off the excess. Now this might be a new one for you, but it is important, so listen. If you think you have too much sealer on the deck and it is no longer soaking into the board, wipe it off before it dries. Not only will it look better but will also prevent the pooled sealer from peeling off. Let it dry. So far you have done a marvelous job, don’t spoil it now by being impatient. Let everything dry before you start to put the tables and chairs back on the deck and for goodness sake keep the dog off it or you will have paw and claw prints on your nice new sealer. Maintenance. As with wooden deck, the composite deck also needs maintenance. At the first signs of mildew returning, you just have to wash the deck with Composite Deck Cleaner and a hard bristle brush, rinse it with a garden hose and let it dry. After this just apply a single coat of clear sealer to get the deck looking good again. All this time we have been talking as if you will be doing the job as DIY. Sometimes though you may not be able to manage the job or you just may not have the time for it. When that happens you should call in a professional to do the job for you. Which type of professional should you call to do this type of job? A painting contractor could do it or a carpentry contractor, but the most likely contractor to call for this job would be a handyman. Handyman services might charge you for the job or may charge you an hourly rate. Whichever it is will depend on the project. You will be asked to pay an hourly rate (probably around $80 per hour depending on where you live and the skill and experience of the handyman) when the professional either has not done the job before or doesn’t know if there are any unknown problems lurking in the background. He will only charge you a set price if he is sure he knows what everything will cost. Not knowing if there are unknowns doesn’t mean that the professional is useless at the job; it just means that something unexpected might crop up. An example of this could be that when he washes off a load of mud and cleans up the deck, he notices that there is some rotten wood which needs replacing. Not a difficult job but it is something for which he hasn’t planned. It really doesn’t matter which way payment is made as long as it is agreed before the job starts. The size of the job. This can mean both the physical size of the job as well as the complexity of the work. Make sure you ask the professional to specify when asking them for a quotation. The handyman’s experience. A handyman with a lot of experience will know what he is doing, be at ease with the tools and construction methods and will be quicker doing the work than someone who is just starting out. An experienced person will appreciate the obstacles that might crop up and will know clever ways of getting over the problems. Just because he might take less time, don’t expect the hourly rate to be less; it might very well be more expensive, mainly because you have to pay for the benefit of his knowledge and experience. Handyman’s licenses. Handyman’s license requirements can be very varied and will mainly depend on where you live. Some states do not require a handyman to be licensed while other states require a handyman to be licensed and belong to a trade association just like a contractor. The main advantage of hiring a licensed handyman is that you can be fairly sure of using someone who has proven that they know how to do the work. Traveling distance. Most handymen say that they don’t charge for travel and advertise as such. What this usually means is that there is no charge for travel if you are local to where they live or if they have to collect some materials. If you live miles from anywhere and there is a considerable mileage and traveling time involved then expect to either be charged for mileage or have the hourly rate increased slightly to accommodate to the extra expenditure. Make sure you ask about this before you hire anyone. Remember that all the time the handyman works for you will be charged. It, therefore, makes sense to do as much of the non-skilled work as possible to save yourself money. For example make sure you move all the decking furniture out of the way and remove any potted plants that might be an obstruction. Offer to buy the deck cleaner and stain yourself so the handyman is charging for labour only. Don’t forget to tell the handyman that you will be doing all this so he doesn’t incorporate the cost into his quotation. Shop around for three or four different quotations to get an idea of what should be charged. Don’t always accept the lowest price as the other contractors may be offering some other benefit for the money. Some handymen offer discounts for special groups such as veterans, disabled and retired folk. If you fall into one of these groups then ask, you never know you might be able to save some money. Cleaning, re-staining and sealing your deck is a relatively easy job and is something that must be done regularly to make sure your deck remains in good condition and looking good. Real wood and composite wood decking, both need similar treatments and today we have looked at both and shown what can be done. We hope you have learned something new today and if not then I hope you appreciated the reminder.